The finest Arabica coffee beans from Brazil and Honduras, blended with washed robusta beans from Uganda, resulting in a very full-bodied, strong, but not bitter flavor. 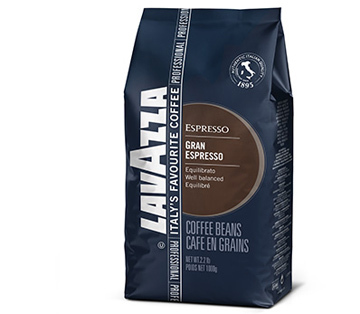 This rich blend of Lavazza Gran Espresso coffee beans is especially liked by espresso drinkers who prefer a creamy Italian espresso with a pleasant after-taste. Features aromas of dark chocolate and spices for a creamy and enticing espresso. The finest Arabica coffee beans from South and Central America, blended with washed robusta beans from Asia and Africa, resulting in a very full-bodied, strong, but not bitter flavor. This coffee is very smooth, not bitter. Makes a great crema in the Jura coffee machine! We have been drinking this espresso for several years after trying many other brands. This is the best we've ordered. Lavazza Gran Expresso is a good strong coffee - with which I start my every day. 1st thing in the morning, get the coffee going; whole bean, freshly ground, made with pure spring water. Lavazza has been my 1st choice for several years now; the 1st thing I wanted to say, it's my 1st cup in the morning. Great beans for Espresso, Americano, Latte and Macchiato. No bitterness, perfect roast, low in oilyness so not harmful to grinders of full automatics. Grinding coffee, daily, as used, is clearly the way to go. I like a strong coffee, I drink it black and Lavazza Gran Expresso is excellent. I have it with breakfast every morning and it makes my day.